Locksmith in Hoddesdon | 24HR Call out | Fast response | Locked out? When it comes to finding a locksmith in Hoddesdon, you have come to the right place. At Access Denied, we have a great deal of experience in offering locksmith services throughout Hoddesdon and the surrounding areas. With a wide range of services and a team of experts, we’re able to offer an unmatched service. Finding an auto locksmith in Hoddesdon that you trust can be difficult. After all, how do you know who is best and who will provide the level of service that you need? Luckily, you can always count on us. We have been providing locksmith services for a number of years and during this time we have been able to solidify ourselves as one of the best. Whether you need help at home or with your vehicle, you can contact Access Denied. At Access Denied, we offer the full range of locksmith services. Rather than offering one or two key services in the same way that many of our competitors do, we extend ourselves far and wide. This means we’re able to tackle lots of different problems, in lots of different ways. For example, we can help if you’re locked out of home or out of your car. Plus, we can also help when you lost a key or if you’re key snaps. In fact, we can even help out with replacement locks and replacement keys. Simply, let us know what you need and we’ll be there in a matter of minutes. We understand that most problems with locks and keys are urgent; this is because without a fully functioning lock or access to your home and car, you’re pretty stuck. It can put a halt on your day, cause chaos and end in a great deal of disruption. This is why we ensure we work quickly at all times. From the moment you contact us, it’s full steam ahead. Not only do we make sure we get to you as soon as possible, but we also make sure we finish the job as soon as possible. When you choose Access Denied, your problem will be fixed in no time. To find out more about hiring a locksmith in Hoddesdon, get in touch. You may not have found yourself locked out in Hoddesdon before, but it’s something that happens to most people at one point or another. Simply, getting locked out is very easy to do. If you have a spare key to hand, this won’t be a problem. However, not many people do. Assuming they won’t be the person to get locked out, a lot of our customers only have one key and this can lead to problems. Luckily, whether you’re locked out of home or your car, Access Denied can help. At Access Denied, we understand the annoyance and stress that comes with being locked out in Hoddesdon. However, it’s very easily done. Perhaps you ran out of the front door without grabbing your keys or maybe you shut the car door behind you with the key still in the lock, you may even have a child who caused the problem. Either way, it’s a problem that’s straight forward to solve. Whether you’re locked out of home, work or your car – we can help. Using our state of the art equipment, the Access Denied team can gain access to your car and property. We do this in a way that doesn’t cause any damage to the lock mechanism, which is important. Otherwise, you could find yourself faced with additional repair costs. This is why we don’t ever recommend you attempt to gain access yourself, as you run the risk of causing damage to the lock or the door. Instead, seek the help of professional locksmiths. At Access Denied, we work efficiently and effectively whenever we’re contacted by someone who is locked out in Hoddesdon. From the moment you contact us, we work quickly. We take the time to find the best solution and then we ensure the problem is solved as soon as possible. This ensures you have access to your car or home in record time. To find out more about being locked out and to contact a locksmith in Hoddesdon, get in touch with Access Denied. As a team of professionals, we’re able to help. Though many of our services are aimed at those who are locked out or are faced with a lost key, we also offer excellent lock replacement services. If you need a lock replacement in Hoddesdon, Access Denied can help. As professional locksmiths, we have a great deal of experience in lock replacements and fitting new locks; this means we really know what we’re doing and can provide an unmatched service. Rather than simply offering a standard lock replacement in Hoddesdon, we go above and beyond. Whether you need a specialist lock or you have a unique request, our team of experts can help. There are a number of reasons as to why you may need a lock replacement. For example, you may have recently moved home and you require brand new locks. Perhaps you have lost a key and need new locks to boost security or maybe you simply want to replace your existing locks with those that are more secure. You may even want to upgrade the locks on your vehicle. Whatever the type of lock replacement in Hoddesdon that you need, we have the tools and experience to do the job well. When it comes to lock replacement in Hoddesdon, we don’t mess about. We understand the importance of having safe and secure locks, which is why we always do our best to ensure that’s exactly what all of our customers have. A lot of people assume that having a locks replaced is a hassle, but it’s really not. There’s no need for the process to take a long time and with the right equipment, new locks can be fitted extremely quickly. When you choose Access Denied, you are choosing an unmatched locksmith service. With state of the art equipment and modern technology, we are able to provide a professional locksmith service to all of our customers. If you need lock replacement in Hoddesdon, we’re able to guarantee a fantastic service. Plus, as we’re completely mobile, there’s never any need for you to bring your vehicle to us. Instead, let us come to you. Very few people consider the possibility of their key snapping. After all, keys are strong and therefore they won’t snap, right? Wrong! Keys snapping is very common and it can cause a huge problem. Think about it, with a snapped key you’re pretty stuck. You’ll be unable to drive your car, unable to access your property and unable to get home after a long day. All of these can lead to chaos, a disrupted day and ruined plans. That’s why, when your key snaps, it’s important to seek professional help immediately. This is where Access Denied comes in. At Access Denied, we work hard to help those who have a snapped key. We understand that it’s a huge inconvenience and therefore we are dedicated to fixing the problem in no time. This is usually done by issuing a replacement key, which we create then and there. With Access Denied, it’s all about providing a professional service in record time. So, though we work quickly, we don’t ever cut corners. When you choose one of our locksmiths, you are guaranteed the high quality service you expect. In order to provide our high quality and professional service, we use the latest locksmith methods and state of the art equipment. Though there are cheaper options available, we firmly believe in the importance of using the very best. This is what sets us apart from the rest. Thanks to our expertise and equipment, our service is unmatched. Whether it’s a key snapped in Hoddesdon or a lock replacement, our service is always flawless. When it comes to replacing a key snapped in Hoddesdon, come to Access Denied. As professional locksmiths and experts in our field, we’re able to offer a range of services and can help with whatever problem you have. Whether it’s a snapped key or a lost key, you can count on us. For more information on finding a locksmith in Hoddesdon, get in touch. Call us today on 07534 277020 for a no obligation quote or for more information on any of our services. Alternatively, get in touch online. This is not a problem and is the most common reason we get calls. Our non-destructive methods of entry mean we can open your car in no time at all. Call us now for a call out in as little as 30 minutes by one of our Hoddesdon Locksmiths. Access Denied Hoddesdon Auto Locksmiths can provide new keys for your car created to the highest of standards within 30 minutes. Our fully trained team are 24 hour emergency auto locksmiths so you can get to us when you need to. Our Hoddesdon Auto Locksmiths will always be prompt and professional regardless of the time of day that you call us. 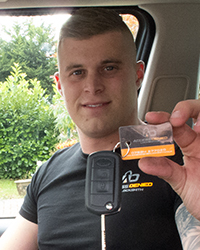 Access Denied have trained staff working all over Hoddesdon meaning a member of the team of Auto Locksmiths is always within 30 minutes of reaching someone when they call. We will never make you wait longer than necessary to help you out.